About a year ago I visited a Wolfgang Puck restaurant in Washington, DC called The Source, (http://www.wolfgangpuck.com/restaurants/fine-dining/3941). They had an appetizer that I really liked, Tandoori Arctic Char. Arctic Char is a wonderful fish with light orange flesh and a great flavor that I find similar to salmon. The fish was prepared with Indian Tandoori seasoning and was so good that I have been thinking about it ever since. So, I decided that I needed to try it at home. I didn’t follow a recipe for this meal, I just made it up as I went along, so my notes on how I prepared it are below. 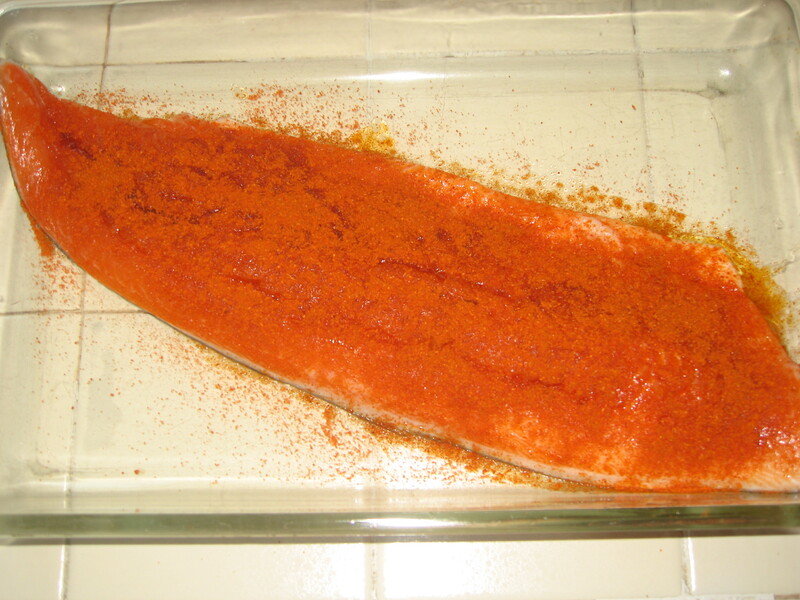 I purchased an Arctic Char filet, rinsed it and rubbed it with olive oil, then coated it with Tandoori seasoning. 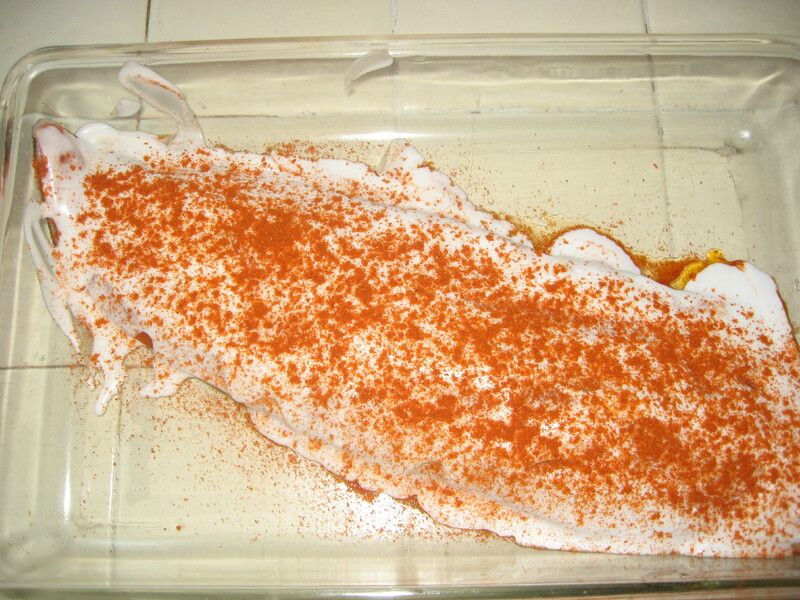 I used the Penzey’s Spices Tandoori Seasoning and coated the fish heavily with it, placing it into a glass baking dish. Then I covered it, put it into the refrigerator and let it sit for 2 hours. I pulled the fish out of the refrigerator and let it warm up for about 30 minutes. Then I poured canned Coconut Milk over the fish, covering it. I also lifted up the fish and put a little Coconut Milk under the fish. Then I added a little more Tandoori Seasoning on top. I let this sit while I started working on the rice. In a medium pot, I added 4 cups of Chicken Broth and began heating it up. I cut up 1 bunch of Green Onions into 1/4 inch slices and added them to the Chicken Broth. 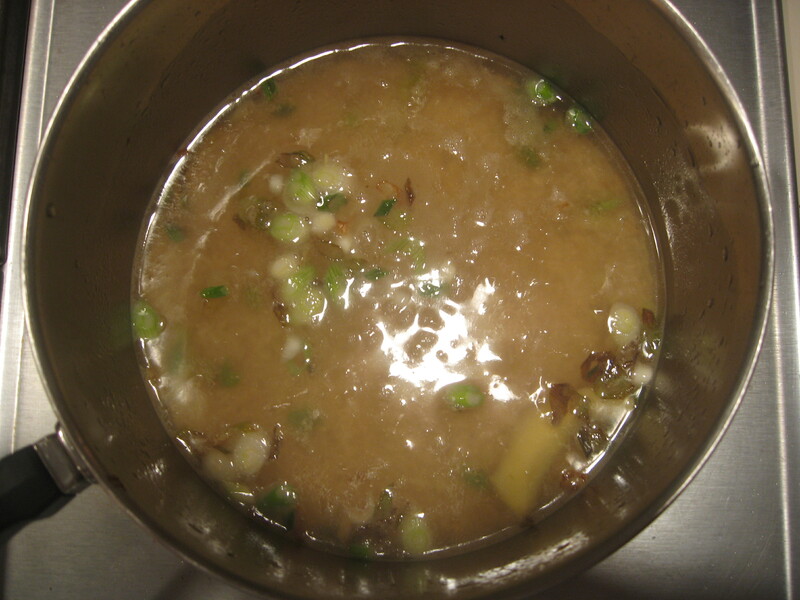 I also peeled a 1-inch piece of Ginger root and sliced it into 1/4 inch slabs, then added them to the Chicken Broth. Once the broth was boiling I added 2 cups of Basmati rice (basically followed the package directions for water to rice ratio). The directions said to stir the rice and broth, then reduce the heat, cover and leave it alone – so I did just that. 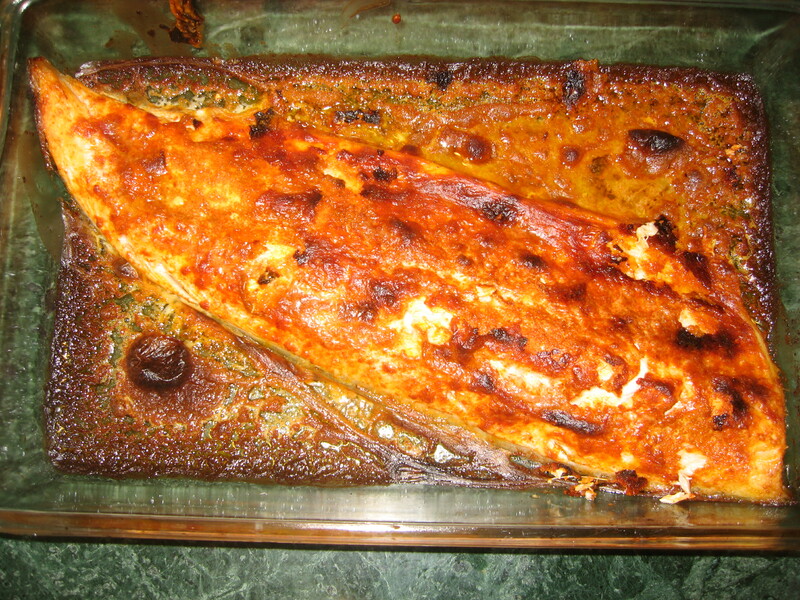 While the rice was cooking I put the Arctic Char under the Broiler at 500 degrees. I cooked the fish about 10 minutes or until the fish flaked easily and the coconut milk browned. Then I pulled the fish out, covered it and let it rest until the rice was done. 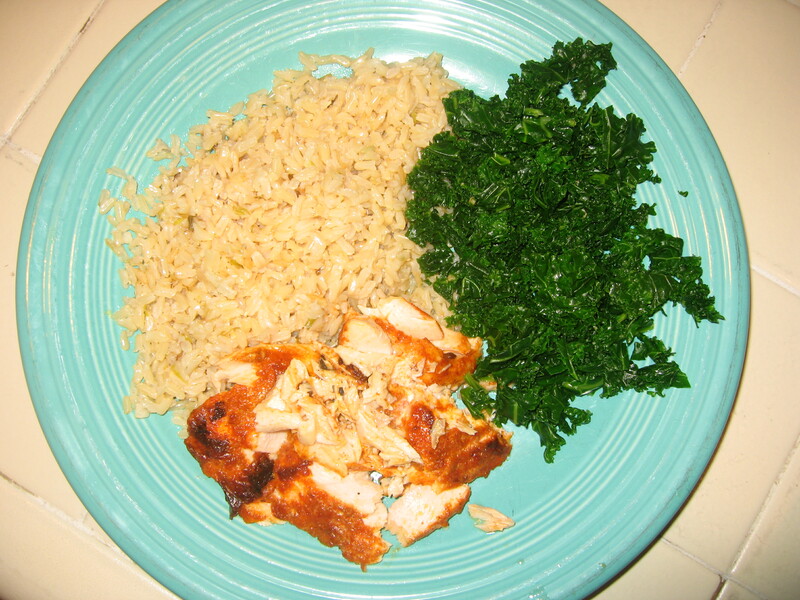 I also cooked up a little Kale to add a vegetable and some color to the meal. Well, everything for once! The fish was very moist and had that great Tandoori flavor I had been craving. The coconut milk added a nice creamy touch to the dish also. The ginger and onion flavors of the rice were a nice complement to the Tandoori seasoning giving the meal a nice Asian flare. Hummm, there wasn’t enough fish I guess – really could have kept eating this all night. The Source dish came with a Cardamon Raita which I tried to replicate with the Coconut Milk. I might actually try making the Raita next time and cook the fish “dry” with just the Tandoori Seasoning, just to see how that tastes. For this meal, I poured a Pinot Noir from California (Radio-Coteau I believe). I find that Pinot Noir goes really well with Asian food and frankly I was just in the mood for a red wine. You could also go with a white wine here, perhaps a Chardonnay (a rich, lightly oaky style) or a Rhone style white like a Roussanne. The Pinot Noir however worked really well with the full flavors of the fish. Give it a try and let me know if you enjoy it as much as I did. Windsor Earl Grey – Sage Vodka!